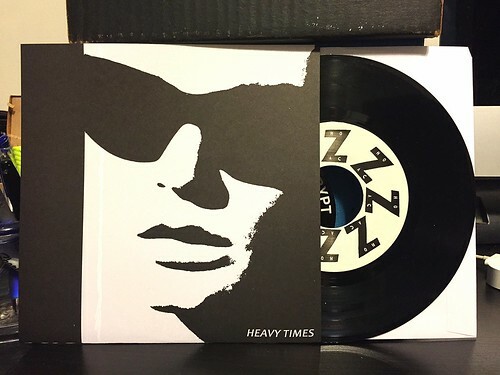 I Buy Way Too Many Records Dot Com: Heavy Times - Black Sunglasses 7"
After I wasn't really feeling the last 7" that Heavy Times released on Randy records, I decided to be a bit more judicious next time they had a record available to purchase. I intended to try it out before blindly leaping into the next release as it is obvious the band is in the midst of a direction change. However, since HoZac decided to send me a copy of this new 7" for review, they kind of made the decision for me, so here we go. Starting off, you kind of feel like this band has been taken over by robots to some extent. Opening track "Black Sunglasses," like much of their last 7", is single focused in its new wave, pseudo electronic delivery. In particular, the vocals are completely monotone and devoid of emotion. It seems intentional, but I kind of miss the chaos of their earlier records. "City Lights" kind of follows the same path, pretty robotic and not really my thing. Expecting more of the same, I flipped over to the B side but found a nice surprise waiting for me instead. "Bad Brother" is very much a rocker, with catchy guitar riffs and the sort of camouflaged pop that I've always loved from Heavy Times. The good times continue with the final entry "Choked Up." This is also a great song that's the most upbeat and hooky of the bunch. There's some really cool dueling guitar interplay and the vocals are by far the most melodic. All in all, this 7" is kind of a mixed bag. I don't really dig either A side song very much, but the B side is back to back hits. It's an interesting mix and I'm curious to see which direction Heavy Times heads in next.